By Capt. Katherine Troxell, 551st MP Co.
GRAFENWOEHR, Germany — Something as small as a cup of coffee can have a lasting expression that can last a lifetime. 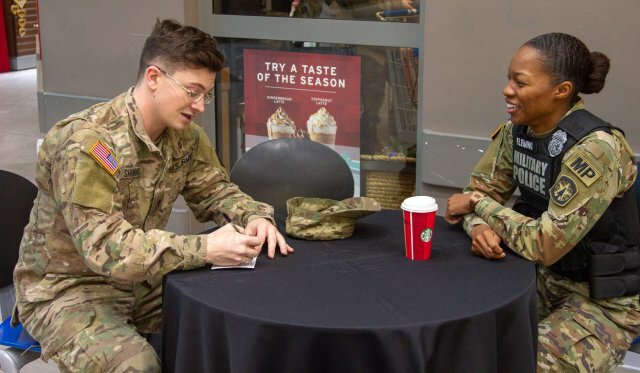 Soldiers assigned to 716th Military Police Battalion, 551st Military Police Company, ‘Hooligans’, enjoyed a cup of coffee at the Tower Barracks local coffee shop in Grafenwoehr, Germany, with the members of the Bavaria community on January 4, 2019. Spc. Robert Frenes, a military police and the lead planner for the event, stressed that he wanted the public to know that they’re not just there for when they get in trouble. Frenes said, “It’s great to get out and be seen in a positive light, it lets the community know we are here to keep them safe and we are approachable if they need help. The company’s focus while deployed for nine months has been building community relationships, providing law enforcement on and off post, and working closely with the German Police Department.